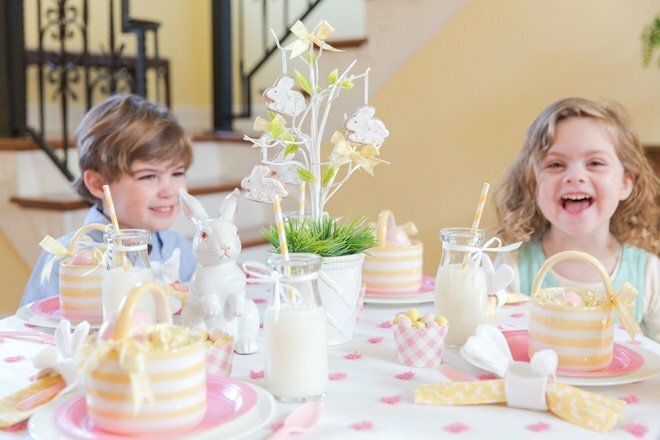 Easter Kids Table | Easy and Simple Tips and Ideas! I know it might seem a wee bit early to chat about all things Easter, but we just love Easter here and so we had to start the fun early! Plus, I hope it gives you time to recreate the ideas for your own family. So let’s chat about the Easter Kids Table! 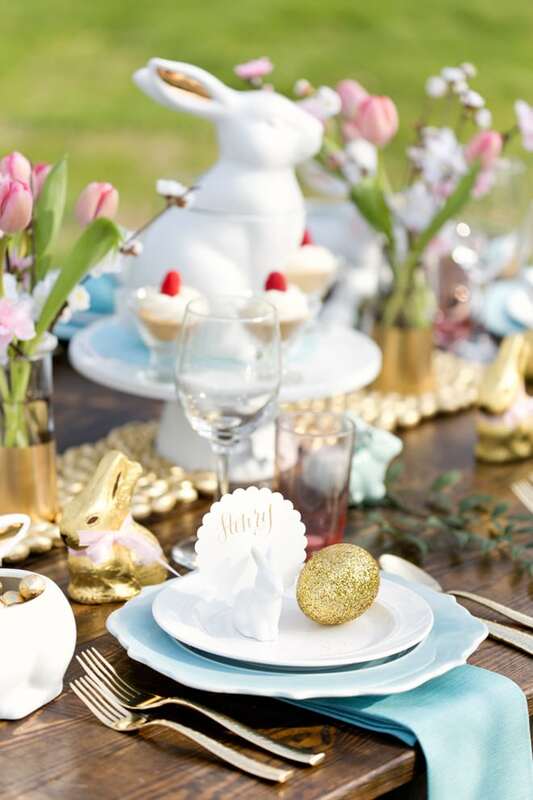 If you have a lot of little ones you want to keep busy for your Easter meal (or just for an Easter-filled playdate), then I’m sharing a table we’ve set for our own little one. Key things: it’s simple, sweet, and full of Easter charm! Let’s chat details! To recreate this look, head to the fabric store for a yard or two of a gingham print. We clearly love an orange and green color palette but any pastel shade will be perfect! You can leave the edges as they are or hem for a polished look. Don’t forget about no-sew hem tape if you want to save time. I covered my daughter’s little play table but I’m eyeing this table from Pottery Barn Kids that’s a larger rectangle for lots of little ones. So that gives you your base for your Easter kids table! Each place setting was full of all things orange and green! Don’t worry about the “no plastic” rule when it comes to kids! Sometimes it’s easier with little ones to let them use plastic because it’s lighter-weight for their little hands and easier to clean up. 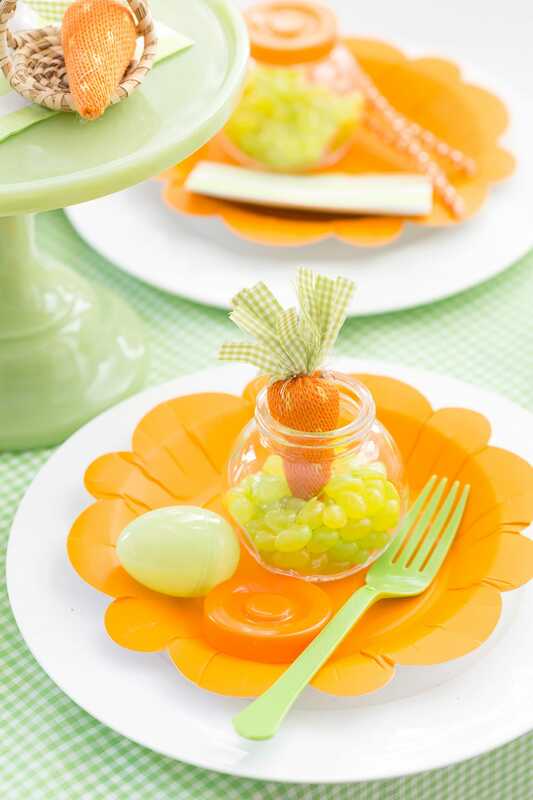 A simple white plate topped with a scalloped orange plate created a sweet setting. 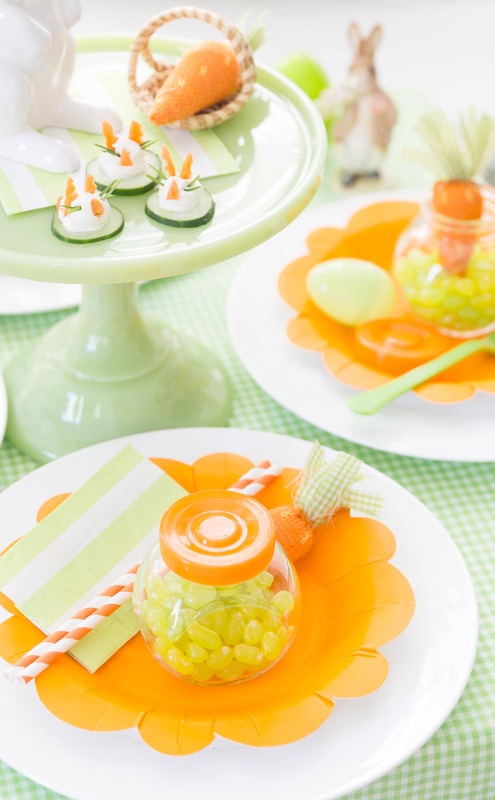 A mini plastic jar filled with green jelly beans and a cute orange carrot is the perfect way to get all the little ones to quickly find their seat. Check your local craft stores (I love Michael’s, JoAnns, Target, and Hobby Lobby) for similar Easter finds! If you love that green centerpiece cake stand as much as I do, I’ll let you in on the secret. It’s by Mosser Glass, and you can shop all their pretty stands here. Their stands are simple and come in the most darling colors (I have two of the pale pink and adore them). 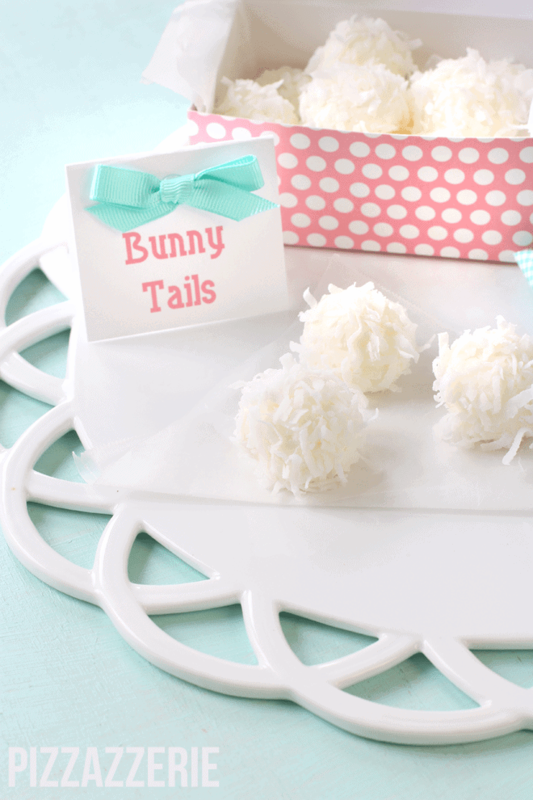 Speaking of centerpiece, a little white bunny and a cute treat for the kids is all it takes! Keep it simple, remember! Target has some adorable white ceramic bunnies in their “dollar” section right now so hurry! Now a lot of you might be thinking “that’s cute but I’d never set that up or have all the little things to set it up”. Friends, it’s a piece of fabric, some cute Easter goodies from the craft store, and that’s it. 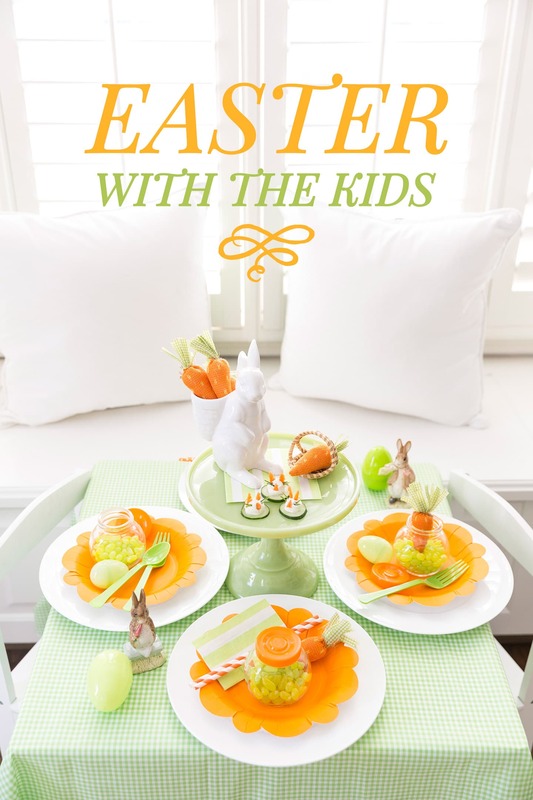 Your kids will adore it, you might actually get to enjoy Easter in peace (I also suggest some Easter coloring books for when they’re done eating) and everyone wins! Speaking of eating… those cute little Veggie Bunny Bites? I know for my own daughter, if it looks cute, she’s more likely to eat it! My Mom came up with these little Veggie Bunny Bites and Blakely LOVES them! Simply take a cucumber slice and top with creamed cheese spread. 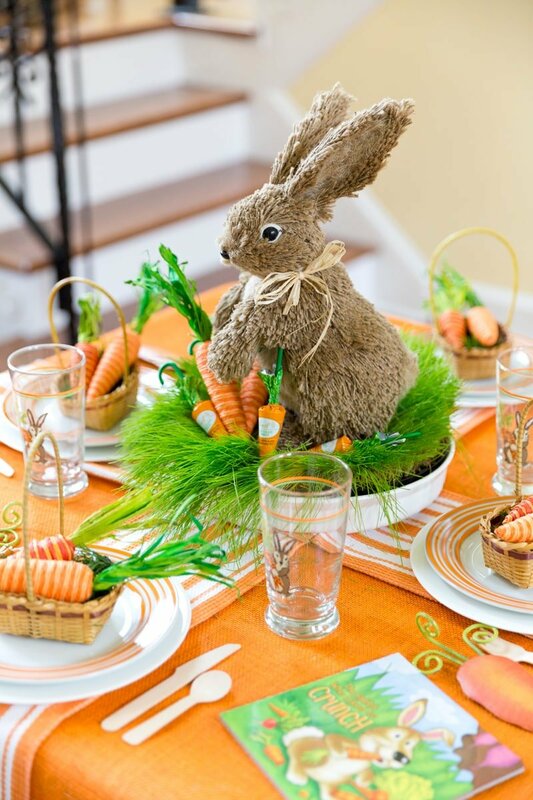 Add on carrots and chives to create a “bunny face”. Ta-da! Easy as pie, friends.